[By Cable to THE STARS AND STRIPES.] NEW York, April 4.-Thrilling contests for records are taking place all over the country between pile-driving gangs in the new shipyards. At present writing, the team's from the Newark and Hog Island yards are engaged in a bitter wrangle over the championship. Anxious patriots and Old Subscribers keep clamoring for a government-chaperoned tournament in the new sport, with championship rules and all the other red tape of the athletic world. The next contest of a patriotic nature will undoubtedly be a national warbread eating tournament, with millionaires as the only scratch entries. THE DIFFERENCE "The United States Army, like the United States Senate, is a body of continuous existence"-- THE STARS AND STRIPES. With this difference: The Army walks and the Senate talks. PILLANTHROPY Syl (at the hospital): That little nurse kinda likes me. Bill (next bed): Why so? Syl: She gave the others one caramel pill, and she gave me a couple. fish they doll themselves up with that gets 'em. And don't, when you write, refer to her sailor-friend as a "gob." She won't understand that it's a term of affection, and will probably get sore and marry the son-of-a-gun out of spite. Just lay it on a little thicker in your letters, and trust to luck that the sailor will foozle his chances. Sailors have done it before. The A.E.F. postal authorities aren't falling asleep on the job. A letter reached France the other day addressed to "American Fighting Trenches, Paris," and the right man got it. PHOTO CAMERA & FURNITURES The best and largest choice at the cheapest prices TIRANTY 91 Rue Lafayette, PARIS Corner of Fbg. Poissonniere, Metro,: Poissonniere. Near the Fare de l'est and Gare du Nordic. ENGLISH SPOKEN. Special service for English and American customers. 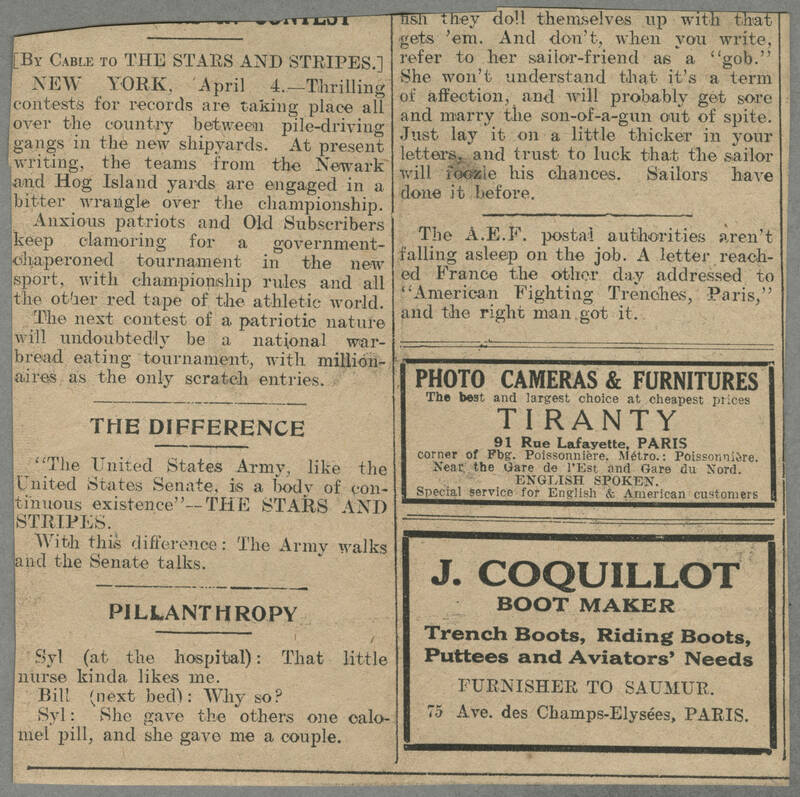 J. COQUILLOT BOOT MAKER Trench Boots, Riding Boots, Puttees and Aviators' Needs FURNISHER TO SAUMUR. 75 Ave. des Champs-Elysees, PARIS.